On June 21st, the rays of the sun lie in the tropic of cancer. So, it is the shortest night and longest day. Northern hemisphere faces nearer towards the sun. So northern hemisphere experiences the longer day and shorter nights. In these days northern hemisphere experiences hotness and southern hemisphere experiences coldness. In those days, northern hemisphere experiences summer season whereas southern hemisphere experiences winter season. On September 23, the rays of the sun exactly lie on the equator. That day both hemisphere experiences equal interval of day and night. So, there will be no extreme hotness or coldness. 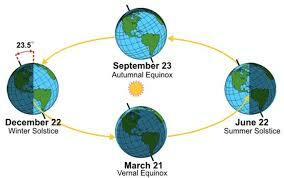 In those days, northern hemisphere experiences autumn season whereas southern hemisphere experiences spring season. On march 21st, the rays of the sun again lie on the equator. Day and night have a same interval of time. So, there will be no extreme hotness or coldness. In those days northern hemisphere experiences, spring season whereas southern hemisphere experiences the autumn season. On December 22, rays of the sun directly lie on the tropic of Capricorn. So, it is the shortest day and the longest night. Southern hemisphere faces nearer towards the sun. In those days, northern hemisphere experiences coldness and southern hemisphere experiences hotness. In those days, northern hemisphere experiences winter season whereas southern hemisphere experiences summer season. When the earth moves nearer to the sun, the earth becomes hotter and when the earth moves farther to the sun, the earth becomes cooler. Due to this phenomena, earth experiences the different season. On June 21st, the rays of the sun lie on the tropic of cancer. On September 23 the rays of the sun exactly lie on the equator. On march 21st, the rays of the sun again lie on the equator. On December 22, sun's rays directly lie on the tropic of Capricorn. How many seasons are there? What are they? Which one is the longest day, as well as the shortest day of the year? June 21st is the longest day and December 21stis the shortest day of the year. Which is the longest day and shortest night of the year? June 21st is the longest day and shortest night of the year. When sun rays lies directly in the tropic of cancer? Which season occurs in those days and why? On June 21st, the rays of the sun lie in the tropic of cancer.Northern hemisphere faces nearer towards the sun. So northern hemisphere experiences the longer day and shorter nights. In these days, northern hemisphere experiences hotness and southern hemisphere experiences coldness.In those days, the northern hemisphere experiences summer season whereas southern hemisphere experiences the winter season. When sun rays lies directly in the tropic of Capricorn? Which season occurs in those days and why? On December 22 sun rays directly lie in the tropic of Capricorn. Southern hemisphere faces nearer towards the sun. In those days, northern hemisphere experiences coldness and southern hemisphere experiences hotness. In those days, northern hemisphere experiences winter season whereas southern hemisphere experiences summer season. Orbit in which earth revolves around is in ______ shape. How many types of season are there? Which one of the following is the longest day and shortest night? Which one of the following is the longest night and shortest day? Which one of the following is date of equal day and equal night? On December 22 sun of rays directly lies on ______. On June 21st the rays of the sun lies on ______. On September 23 the rays of the sun exactly lie on the ______. give reson of differing length of day and night? Any Questions on 'Season Change '?